First things first – a progess report on my amazing Christmas pudding diet. Over the festives, I lost about two pounds. I will say no more, except that Gemma, my son Dave’s lovely girlfriend, went down to Tesco’s after Boxing Day and restocked for the coming months. This time they were only 76p each. Deflation! She bought eight of them. By summer, I will have eaten myself into invisibility. ‘Appen. Now down to business. Julia Jones, who among her myriad talents is a publisher, has accepted my first and most beloved book, Wild Wood, onto her list, Golden Duck. 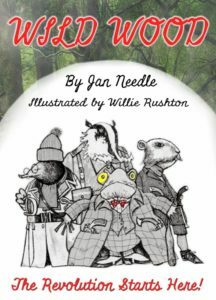 For those of you who haven’t been paying attention, Wild Wood is my version of Kenneth Grahame’s masterpiece The Wind in the Willows, in which Toad, Badger, Rat et al are the villains, and the ‘evil rustics’ are in reality the downtrodden poor, more sinned against than sinning. Hence her decision to schedule it for May Day. When I say villains I’m talking baloney, naturally. Toad and Co are just like you and me – overfed, over fond of picnics and good vino, and just a teensy-weensy bit smug. Hardworking, they’d be called by Tory Central Office, and not in need of benefits (know what I mean?). While those scroungers who live in the Wild Wood, when you think about it, don’t actually do anything. Except hang about on street corners after dark and be menacing. 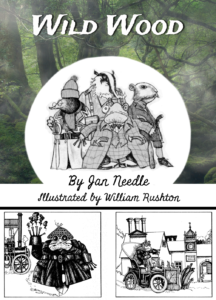 Or grunt and rustle in the shadows to frighten a chap like Moley, who’s a little bit unworldly, don’t you know? Street corners? That’s the measure of them! They don’t even aspire to a street to hang around the corner of. So Wild Wood, alarmingly, is the story of a revolution. Less alarmingly, it’s the story of a revolution squidged. Of hopes and aspirations dashed, of justice and social progress blighted. Of the failure, as ever, of England to become the New Jerusalem. It is a complex narrative, which has already been the subject of at least one doctoral thesis, but rather than lay it out in grisly detail, I’ll give you a snapshot. Let Baxter Ferret, the narrator, hold the stage. 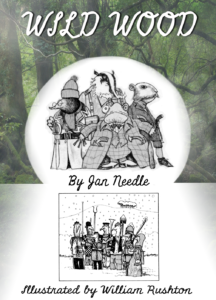 He has just blundered into an early meeting of a revolutionary cadre that will morph into the Wild Wood Volunteers. They are, indeed, deep in the snowbound wood, at the general shop of Wilson, the retired sea rat. A smart, ambitious young weasel called O.B. is talking. I didn’t, neither did I speak. For try as I might, Toad’s latest fad – which others found so terrible, apparently – I could only think of in terms of sheer envy. Unlike his fellows, Baxter already knows and loves machinery. He drives a lorry for his farmer boss – a state of the art 1908 Throgmorton Squeezer – and ends up, through a disastrous accident, actually working for the hated amphibian. Ensnared by Toad, ensnared by his solidarity with the workers – whose leader Boddington Stoat, ‘yellow and peculiarly bitter,’ ensnares his kind and lovely little sister Dolly. The scene is set for tragedy. Rat’s beloved country river seems destined to run with blood. And Baxter can only watch aghast as the opposing factions take arms to enact their rural Armageddon. My son Matti (matti.gardner@gmail.com) designed the cover, and was the techie man as usual, but Julia and I helped with lots of tinkering. It’s gone through a couple of phases so far, and may yet be modified. Please feel free to comment. Next Post A trilogy in four parts!